The Valuation Survey is the Surveyors opinion as to the fair market value of the the vessel at the time of survey. This type of survey is often a requirement of finance companies if money is to be borrowed to buy a yacht, or by insurance companies prior to issuing cover. Bodrum Marine Services carries out Valuation Surveys on all types of vessels throughout the UK and internationally. All our surveyors are recognised by most financial institutions and insurance companies that may require a Valuation Survey. The Valuation Survey is often carried out as part of a Full Condition Survey or Insurance Survey. If the Valuation Survey is carried out separately the limitations of this type of survey will clearly be stated. 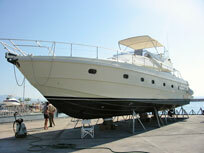 For example if the Yacht is only inspected while afloat this will be stated in the Valuation document. If a financial institution or Insurance Company ask you for a Valuation Survey you will need to find out their exact requirements.